We successfully completed our short film for the 168 film project–no easy feat given the scope of our project and the seven-day time limit! Please take a minute to check out the trailer for our film, DESCENT. Thank you! The Narrow Road team is excited to announce that we’ll be competing in this year’s 168 film competition for a grand prize of up to $1 Million for the production of a feature-length film! The Narrow Road writer and producer, Erik Yeager, will be producing and co-writing the short script with top-rated script doctor, Howard Allen. Erik will also be directing. Anthony Tyler Quinn is confirmed in a yet-to-be-determined leading role, and the Narrow Road team is excited for this opportunity to re-unite for our first group project since the Narrow Road Test Scene. As always, you can support us by making a tax-deductible donation to The Narrow Road through our 501(c)(3) non-profit sponsor, Filmmakers Collaborative, Inc. Your support is appreciated and will go a long way toward helping us ensure the strongest entry possible and the best chance at winning the Grand Prize! We’ll keep you posted on our 168 project entry here on the Narrow Road website. Please check in regularly for the latest. Brilliant artist and Narrow Road friend, Chris Koelle, is releasing his much-anticipated Book of Revelation Graphic Novel tomorrow (published by Zondervan). Please consider visiting Amazon.com to pre-order your copy today. This is certainly a project worthy of our support! THE NARROW ROAD nabs big endorsement! 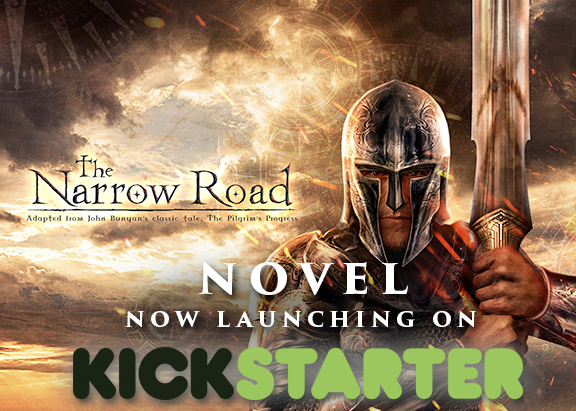 THE NARROW ROAD has received official support from a HUGE online Lord of the Rings and fantasy fan community which boasts over 4 million page views per month (and growing)! The brilliant minds behind MyMiddle-Earth.net are thrilled about our Pilgrim’s Progress project and have graciously offered to support us as we move forward. If you’re a fan of J.R.R. Tolkien, C.S. Lewis, or other fantasy tales, you’ll love MyMiddle-Earth.net. Visit the site to see what these guys are up to, and make sure to check out MyMiddle-Earth Radio’s great podcasts. You’ll have a blast! Thanks guys! We’ll make you proud.